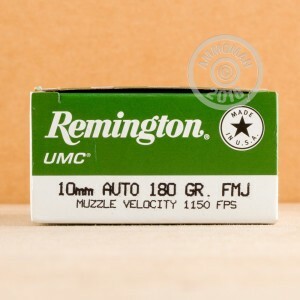 Remington UMC has become known as one of the go to ammunition choices for cost effective range time. 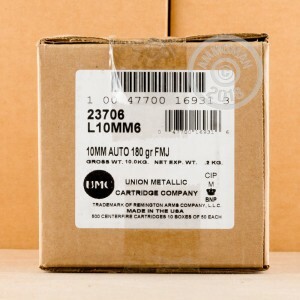 This 10mm Auto follows in step with a 180 grain metal cased bullet and is made from reloadable brass cases. 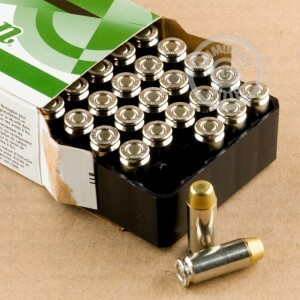 The result is a training ammunition that is positive functioning with consistent performance. I use a 1911 model Smith and Wessen in 10mm. The ammo performed very well. No stovepipes. It was used only at a range at 25 and 50 yards. Any problem with my groupings were user problems i.e. my eyesight is just not what it used to be. There was very little build up when I cleaned the gun although I only put 50-75 rounds through it as my toy for the day was an MP5. Will buy again. These are good rounds with quality nickle-plated cases for a price that is close to the imported crap.